The Irish Spring Get Out Get Dirty Sweepstakes is open only to persons, who are eighteen (18) years of age or older and legal residents of and physically located within the forty-eight (48) contiguous United States or District of Columbia. 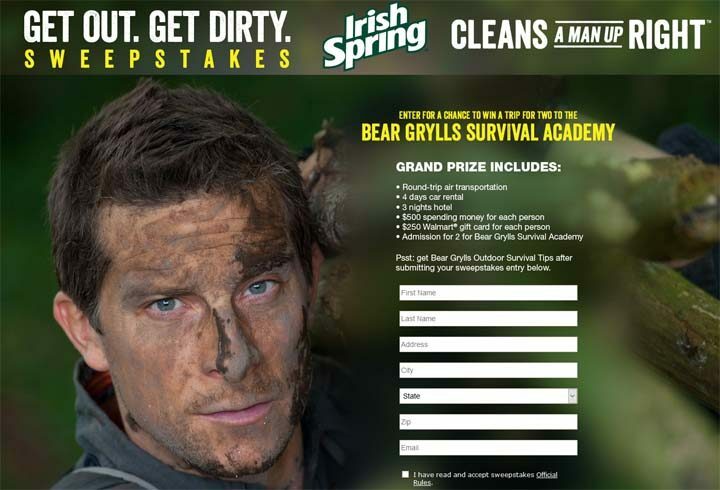 The Irish Spring Get Out Get Dirty Sweepstakes ends at 11:59 P.M. ET, June 30. You may enter by visiting irishspring-getoutgetdirty.com and following the instructions to complete the entry form. Entries are limited to one (1) Entry per person/Address per day. TWO (2) PRIZES: Each prize winner will receive a trip for two (2) to a Bear Grylls Survival Camp in upstate New York. The Prize consists of:  round-trip coach air transportation between a Sponsor-selected major metropolitan airport near winner’s residence and a Sponsor-selected airport in or near the Camp;  an economy standard size car rental for four (4) days;  three (3) nights hotel accommodations in a hotel selected by Sponsor;  $500 spending money per person to cover meals, etc. ;  $250 Walmart gift card per person to purchase Bear Grylls merchandise; and  two (2) tickets to the camp. Approximate retail value (“ARV”) of each Prize: $7,400. Total ARV of all Prizes: $14,800.